It's been more than a year since Polaris cards release (29/06/2016) and we still don't have proper VP9 hybrid acceleration of Polaris cards using YouTube with Chrome. Prior to Windows 10 Creators Update (April 2017), we could force Chrome by using the command line parameter chrome.exe --enable-accelerated-vpx-decode=2 in order to get VP9 hybrid acceleration on YouTube. Since Windows 10 Creators Update release, ALL AMD drivers are broken and by using the above command line you only get a stuttering unwatchable video experience, not because of performance but because of incompatible decoding with the result of a video stream going back and forth. 1) Have you seen/ reproduced that broken VP9 decoding of YouTube clips using Chrome with VP9 hybrid acceleration enabled and Windows Creators Update ? 2) When are you going to fix it ? Hi, i dont see what are you talking about, what is broken?! Use Firefox or Microsoft Edge or the app from Microsoft store, to solve your problem. First of all, you have to understand that you replied to a different but close to my question. As I clearly say in the title and in the context of my question, I'm asking about Chrome support. Anyway, I will reply to your reply. I have never used Firefox and I'm not intending to do so now. Edge is not a fully developed browser, it needs a few years more. For example, I can't use a browser that doesn't allow me to change the path of the local cache from the default path of C:\ which is an SSD to my D:\ which is a HDD. If you happen to know a way to move the cache of Edge from C:\ to D:\ please elaborate. But I did try Edge and the default behavior is worst than Chrome because it doesn't allow you to access VP9 content, which means it doesn't allow you to access content of more than 1080p60 resolution. In order to access 1440p60 or 4K (2160p60) you have to put in the Edge browser about:flags and then go to Media Source Extensions and set Enable VP9 video format option from Automatic to Always On. If you do that, you can access >1080p content in YouTube but still the CPU usage is very high, just slightly slower than software decoding of Chrome x64 v59 and I certainly doubt if hybrid VP9 accelation in on for Edge using Youtube. Is there any way to check from Edge or any other app/ tool if hybrid VP9 is used and not software decoding of VP9 content using Edge and YouTube ? I remind you I'm talking about Windows 10 x64 Creators Update (build 15063.483) using a RX 470/ 8GB card a Core i5 2400 CPU and latest 17.7.1 drivers. What is that app of Microsoft store that you mentioned ? Give me a name or a link and I'll try that too. Well, for mentioning, drowngrade your driver to the 17.5.2, all versions above this version, it has the framebuffer broken, is all the time at 100%, you dont notice fps drop, but you feel stutter. Dont know how to help you more, i dont understand much this thing of decoding for the browsers, maybe some expert come here and give some information about that. After my little investigation, it seems that Firefox didn't use for the last many months VP9 hardware acceleration for any card at all. It has though a very fast software VP9 decoder - ffvp9 - which is faster than Chrome's VP9 software decoder - libvpx. Maybe you didn't feel the difference due to your fast CPU. Also, like Edge, you have to manually force it in order to use VP9 content from YouTube by setting a specific option. You have to go to about:config and set media.mediasource.webm.enabled to true. The last few days, Firefox v55 beta 8, seems that enabled VP9 hardware decoding so could you give it a try with this YouTube clip reporting CPU utilization and frame drops ? You have to select 4k60 fps stream of course. Now, regarding Tubecast, it seems that it has an almost 0% CPU usage even selecting 4k60 fps because actually it uses hardware acceleration of H.264 streams, as the app is not capable of fetching VP9 content. I have a true VDSL2 (FTTC) 50Mbps line and I monitor the bandwidth of youtube streams in order to see what is really going on. So, lets forget Tubecast completely and concentrate on latest nightlies of Firefox. Well, I tried latest Firefox x64 v55 beta 10 with all possible options forced enabled and there is no difference in CPU utilization between VP9 HW acceleration and VP9 software decoding. It immediately fetched the 4K60fps VP9 streams without "hacking" the about:config options but with no visible acceleration. I even set media.hardware-video-decoding.force-enabled to true, but with no luck. In fact, trying to decode the Youtube stream of the 4K60fps clip above, using Firefox is the worst experience compared with to the other browsers, because it turned out like a slideshow ! hello there, sry for the late answer, i realy try to stream what you ask, but im having some issues with my internet connection, its hard to load the videos in 4k, im going to fix it very soon... from my pc usage when recording and seing videos in 4k, the cpu goes from 50% to 90% with the graphic card maxed out and consuming 9GB of ram. and you are right about firefox, is good for somethings, but reproduce 4k videos is like a slideshow, not sure if is the drivers problem or from firefox, but now im running chrome, it runs very well 4k, my problem is only my connection right now, suposely i should have 200MB, but right now im only with 100MB. Well, it seems that Edge and Firefox do not support VP9 hybrid acceleration of Polaris cards due to their different hardware decoding architecture as I read out there - they can only use VP9 pure hardware acceleration like Kabylake or Maxwell 3rd generation (950/960) and Pascal cards. Skylake is a another good example of VP9 hybrid acceleration, as it doesn't have pure hardware VP9 decoding support and owners of that CPU could tell us if Chrome/Edge/Firefox supports hybrid VP9 acceleration of Youtube clips on Skylake. I think we have to concentrate only to Chrome, probably it's the only browser capable of using VP9 hybrid acceleration of Polaris cards. Did you set --enable-accelerated-vpx-decode=2 to Chrome in order to use VP9 hardware decoding ? Your CPU, I think is a little faster than mine but close, it would be interesting to see the CPU utilization after using that switch. Also, what exactly is your Windows 10 version - Creators Update or older - and what is your AMD graphics card driver version ? Windows 10 versions older than Creators Update do not suffer from stuttering using Chrome and VP9 hybrid acceleration. We need your feedback regarding this issue and our conversation, we can't talk all alone here! I use Creators Update and i test in 17.5.2 driver version, but now im with 17.7.1, it has the Framebuffer broken, but is running better 4k videos with no vp9... with vp9 is the same. Thank you for the video, it visualizes the problem for everyone. As I told you, every driver after Windows 10 Creators Update does this stuttering of back and forth move of the decoded frames and this is what I actually want AMD to fix, because with Windows 10 Anniversary Update, I didn't have such problems. So, the VP9 hybrid acceleration worked only between December 2016 (first Crimson driver 16.12.1 that enabled VP9 acceleration using Chrome) and April 2017 that Microsoft released Windows 10 Creators Update. Using VP9 hybrid acceleration with Chrome even in force enable mode, it is feasible to decode in real-time or close to real-time a 4K60fps VP9 clip of Youtube, with a decent quad core CPU I guess and a stable >30Mbps line. We need feedback from AMD. I do some new test, with with no force of VP9, and its run wells, that video that you tell to test, it has some issue with it, because when i try to see it, my cpu go 100% and my network goes crazy, like you see on the video that i post... but when i try other videos, my cpu stays at 50%/60% and the network is stable, but still notice some minimal microstutter in any kind of videos in 4K im not sure why is that happend. I do othe video, but youtube block it, because of some rights... and i dont fell like to ask permition to the proper ppl to post the video... so i delete it... but anyway you understand what i mean, and i hope AMD too. Judging from my tests and official AMD's statements, only Chrome or chromium based browsers to be more exact, should be able to recognize VP9 hybrid acceleration and from my tests again, it seems that this can only happen if you force enable it. Now, regarding the stream I told you to decode, it's a high bandwidth stream and I can guarantee you that it has no problem at all. It just has a huge bandwidth, more than usual 4K streams of Youtube, but it's not the only one and has a higher than usual frame-rate of 60fps. If we had a dual core CPU or a slow quad core CPU and a fast network, we might have problems even decoding 1440p Youtube clips, due to VP9 decoding complexity. I have seen that difficult 4K Youtube stream to be decoded in real-time with no frames dropped by an Nvidia 960 card easily, which has of course a fixed-function decoder, not a hybrid one. Also, I have to say that Pascal cards have even faster hardware video decoders. Other 4K Youtube streams are a lot less difficult and should be not considered as valid test streams, because of low difficulty. What we are trying to do here, is to report a problem of broken (back and forth decoded frames) decoding of VP9 hybrid acceleration using Youtube, Chrome and Creators Update and your video of the previous post, shows that clearly. We don't care if there are easy clips on Youtube that our CPUs are capable to decode them without the need of a VP9 hybrid accelerator. If we had a Ryzen R7 (8C/16T) or even R5 (6C/12T) CPU and a fast network, that difficult 4K VP9 stream would be a piece of cake to decode it. After your update with Canary Chrome, maybe it's worth it to try that browser too with my very fast network connection. Did you try a stable or nightly version ? www.google.pt/chrome/browser/canary.html the link of Canary and im not sure if is stable, but works very well. Anyway, if it is a AMD fault, i hope they fix it, because is frustrating. btw, i reproduce the same video in LG WebOS from my TV and here is the result, its very smooth. and can you see that is using vp9. It seems that latest Chrome Canary v62 (x64) works like a charm using VP9 hybrid acceleration of a Polaris card and Creators Update! Firstly, like plain Chrome v59 (x64) it recognizes out of the box VP9 Youtube content but it doesn't enable by default the hybrid VP9 acceleration. BUT if you force enable VP9 acceleration using the --enable-accelerated-vpx-decode=2 switch, you see no stuttering in the video decoding and as you can see in the screenshot, it has a minimal frame dropping of just 35 frames during the whole duration of the clip. The GPU load works exactly like Chrome, but without stuttering and you see the GPU and memory clocks going to the highest levels. The CPU usage is around ~50% on average. So, it seems that AMD's VP9 hybrid acceleration works, at least on one Chromium based browser and force enabled. Of course Canary has some strange behavior as an experimenting browser, for example while writing on this forum it jumps to the beginning of the page with no reason at all, so we definitely need a more stable overall browser like Chrome to implement correctly the VP9 hybrid acceleration. Yes Canary it has some issues, but this one that you refering, you can workaroud if you copy the link from the topic to other tab and close the older, it should fix like this. Thanks for the new information. I have tested Chrome Canary V62 and it works. Sadly , the release(stable) version of Chrome does not have the fix yet although it just updated from V59 to V60. But I think if we still need to use the parameter of "--enable-accelerated-vpx-decode=2" instead of just launch Chrome normally, the issue is not really fixed or functions normally in my opinion. The action above makes VP9 on Polaris looks like not a really official GPU feature, but more than an experiment feature that if it works is just a lucky. For Windows 10's version upgrade frequency seems is twice a year (spring and fall) now, the GPU related application supporting is becoming more important than any other version of Windows in the past. We know every time comes a big upgrade , Microsoft always changes something in the OS that users need to update some application too. The Fall Creators Update is coming soon , I just wonder if we can really expect it still works at that time or will broken again for months and still not work for stable release Chrome. So I am pessimistic on this feature on Polaris since the fact that whatever bug report or open thread at here, no official speaker or engineer to reply for so long time. And even it works, this only works for Chrome but not Firefox or Edge which is still not good enough for users like me who uses Firefox or other Web Browsers. Maybe we only can expect Vega or next generation of AMD GPU when 4k is common for world which can support fully Hardware-Acceleration on VP9. Or Google Youtube changes his mind to support H.264/265 with fully 4k option. but anyway, the micro stutter is presented, and nothing i can do to it, just expecting to someone fix it, but in any case im already assemble new rig, im just waiting for AMD release something nice, maybe the new Rizen with the vega card, or im going to the i9 with 1080Ti, im not sure right now, but im expecting to stay in AMD side, since i sell more AMD products is more easy to have what i want. It seems that Vega still no VP9 hardware acceleration supported. At least I did not see any info on the site(see the "Supported Rendering Format"). Unfortunately, VEGA still has a VP9 hybrid decoder according to this official PDF from AMD. ALL AMD radeon drivers are BROKEN, just like you've said. I cannot believe that AMD has NOT yet managed to get their s**t together to fix all Radeon drivers for the Creators update. it's a shame. 3) Fortunately Canary still works fine. Firefox Nightly(v57) seems supported full AMD VP9 hybrid acceleration, without any additional parameter or settings. It will just works, although it still has frame drops issue, so not perfect for now. But with this real sample to compare to Chrome, it maybe finally turns out it's a browser support issue(or question), not a fully AMD driver issue. I just wonder why no one said or explain it for so long time. Or it whatever is an experiment feature? Now I do not know really. Firefox seems will release Firefox57 at November this year, so just have to wait more that 2 months for stable release. Firefox has an official nightly build site so just google it, no need to struggle to find the build in the firefox ftp site. But user still have to enable the parameter("--enable-accelerated-vpx-decode=2") manually. FYI, AMD broke Chrome hybrid acceleration once again with latest 17.9.1 drivers. It simply doesn't work any more, even using manually the switch "--enable-accelerated-vpx-decode=2"
Hopefully, Canary still works like a charm. Maybe it's Chrome's fault afterall. I think it is driver's fault. 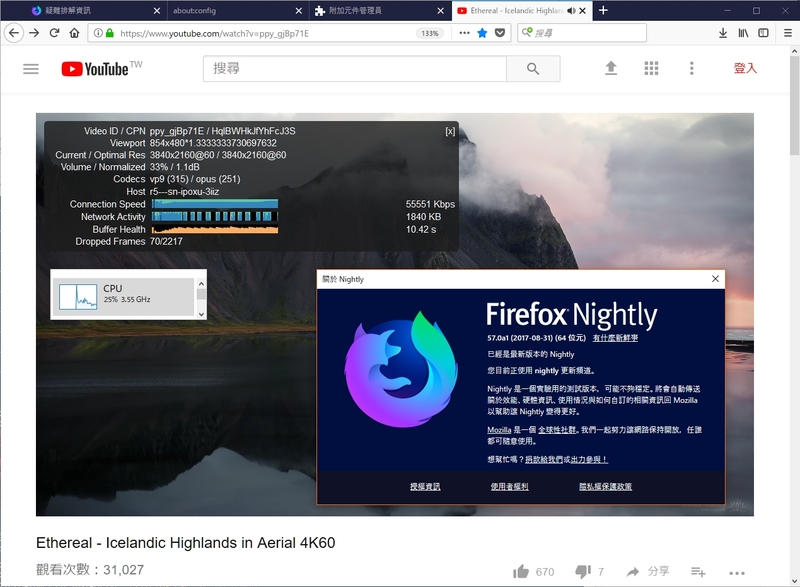 On 17.9.2, both Chrome and Firefox nightly, some time can successfully enable VP9 hybrid acceleration, but some times not. I tried to reload page with the same youtube video several times and find the phenomenon. Thank You guys for sharing. So here I am, an Intel i7-7700K 4.2 Ghz user with some old GPU Asus HD6900 , very old card. Friend sent me a link to play Peru 60fps 8k on youtube and the cpu completely dies at 100% - can't play. Thinking, well, time to replace the PC. Haven't spent much time thinking, but bought AMD 2700X and VEGA56 card. Try to play the video again and OMG, it's the same - very bad. I take my old computer, i7-7700K again, and put NVIDIA 1060 6Ghz - nothing fancy, about 150 euro cheaper card. The video plays absolutely perfect. CPU utilization 7% , 8k Video plays perfect. I don't need to enable any ninja settings. I have only one simple question before I destroy this card into pieces. is AMD going to provide the support for VP9 8k like NVIDIA or not? it's yes or no question. Just to add to the discussion, I bought an RX580 before Christmas and it was super disappointing to find that VP9 was not properly decoded on polaris. Peru 8K was still a stuttery mess on a 2700x CPU. I can't believe it is still an issue on Vega and I feel bad for mpie having to deal with this still. I sold the card just over a month later and bought a 1070ti which as you can clearly see in my screenshot by the utilization of the gpu and cpu is doing it's job. This really needs to be fixed with more content moving to 4k and up or I wont buy another AMD card in future no matter what the in game performance is like. I wont be shocked at all if the Radeon VII still does not decode, though I haven't seen it verified yet.